Cambre, Maria-Carolina (2015). The Semiotics of Che Guevara: affective gateways. London: Bloomsbury Academic. 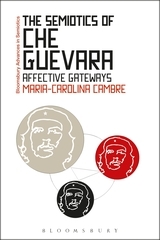 In The Semiotics of Che Guevara: Affective Gateways (2015), Maria-Carolina Cambre focuses on the semiotic significance of images of Che Guevara and its impact on their viral distribution around the globe. Cambre investigates the multiple renderings of the Che Guevara image—appropriations of Alberto Korda’s famous photograph titled Guerrillero Heroico. She considers this image an affective gateway mediating people with different political ideologies in various contexts. In this way, Cambre does not presume the global reach of the image as the inevitable result of a human-led economic and cultural globalization process. Rather, Cambre bridges the gap between a micro perspective on materialities of the “affect” in visual image and a macroscopic view of their impact as a visual phenomenon. Doing so, the author provides us with a more holistic, concrete understanding of the obscured materiality of the abstract, intangible transmission of visual images. The book comprises eight chapters, ranging from a brief introduction to the historical and socio-political salience and branding discourse of the Korda image, to much more complex layers and stages of its actualization of virtual qualities and the discussion of related issues, such as its queer tendency. Chapter two begins with Cambre’s investigation of current controversies surrounding the use of the Guerrillero Heroico image. In this chapter, she delineates its dislocation as a brand, a commercial product, an art-work, and a cultural artifact within and outside of the Cuban context. Building upon theoretical frames from phenomenologists such as Gabriel Marcel, Emmanuel Levinas and Roland Barthes, in chapter three, Cambre discusses people’s encounters with the image, which often tend to be connected with the idea of “hope.” This idea of hope as an animating motif contributes to the virtual recreation and resurrection of the Guerrillero Heroico. Following Hannah Arendt’s (1959) theory of action, the author introduces ethnographic case studies in chapter four to illustrate actioning and the performative aspects of the image; it has an effect on society by allowing multiple interpretations and being politically used by individuals with different ideologies. In relation to the image’s performativity and openness, in chapter five, the author further situates her discussion in semiotics to explain what she is doing differently. She overcomes the limitations of the reductionism of traditional semiotics, which understands the complexity and simultaneity of visual and social realities through signs operating on a plane that is simplified, rigid, and concrete. Throughout chapter five and seven, Cambre explores Donald Preziosi’s (2003) elaboration of Roman Jakobson’s addition of a fourth sign type: artifice. She connects artifice with the anthropological concept of art and agency suggested by Alfred Gell (1998) to illuminate the role of the image’s virtuality as a drive for social and political changes in the world. By doing so, the author maintains a multi-dimensional perspective on the semiotics of images. Particularly in chapter seven, Cambre emphasizes that Guerrillero Heroico itself is an agency that has generative power—the power of affect—to pull its alternative forms into different places to serve different political ideologies and authorize our “actions” in the future. In the final chapter, the author opens a discussion of the queer tendencies of the image as other possible forms of appropriations and mutation. In the simplest terms, Cambre’s research begins with the question of “how and why does the image of the Guerrillero Heroico go viral to different places?” The author then connects this question of the reception, adaptation, and circulation of the image with the discussion of “face” in chapter seven. She maintains that Korda’s image of Che Guevara’s face bears witness to certain experiences, such as anti-imperialist and revolutionary activities. However, Cambre does not discuss the significance of “face” or explain how the material properties of “face” specifically help incubate immaterial forces—internal movements, energy, and virtual qualities emergent and realized in our encounters with “face”—to actualize as particular forms of experiences and “actions.” More specifically, Cambre does not indicate her understanding of the concept of “face” in visual images. For example, “face” can be read figuratively and metaphorically as a frontal/critical “aspect” and “appearance” or is understood in “literal” terms—literally the face of humans or objects (Adams, 2000). Although it seems appropriate to say that the author takes the definition of “face” in literal terms in her analysis of the Guerrillero Heroico, it is still important to clearly identify the concept of “face,” to illuminate its materiality and the abstract mechanism that exceeds the totality of certain features and experience. 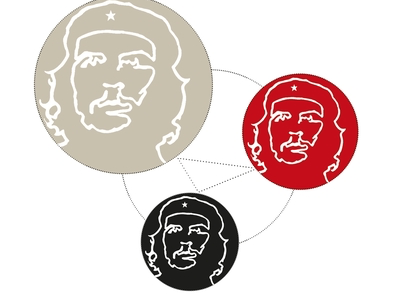 According to the concept of “face” suggested by Deleuze and Guattari (1987), the facial image of Che Guevara can be understood as a landscape, map, or topology, which is abstracted as dominating qualities and norms at a distance and produced as an overcoding of subjects. At the same time, it is deterritorilized at a close-up scale by affording different affective energies such as a fear and hope of subjects (Deleuze and Guattari, 1987). Thus, the ‘face’ of Che Guevara itself is decontextualized from the body and interior forces and functions as an autonomous entity (Deleuze and Guattari, 1987). This understanding may lead us to more concrete questions about the material properties of face, such as: 1) How does Korda image of Che Guevara impose onto us to assume its face? 2) What are these dominant material qualities of ‘face’ of Che Guevara? 3) More specifically, how does this ‘face’ selectively assemble its fragmented and varying movements and illustrations of different elements such as eyes, eyebrows, mouth, and cheeks and still link them with the elements and experience of the original and other appropriations of Korda image? Although Cambre discusses artworks or images of the human figure and their global transmission, she seems opposed to an anthropocentric belief in the sociology, geography, or anthropology of art, that institutional gestures and human creativity are what suddenly transform an ordinary image into “art” imbued with cultural and political resonances. As such, in scholarly discussion of the global circulation of visual images, existing literature on globalization has focused on analyzing the role of images as carriers of certain socio-political and cultural needs in the context of evolutionary globalization. As a result, this perspective based on evolutionary functionalism has produced a simplified interpretation of the global distribution of images as an inevitable, unidirectional movement. To overcome the limited interpretations of the phenomenon, the author pays more attention to the properties and potentials of images that assemble people to distribute and connect mobile images to future actions (Miller, 2010). Cambre also explores the potential of democratic performance in representation and reproduction of Guerrillero Heroico through a multi-dimensional semiotics. This alternative approach to semiotics allows her to consider representation as something that not only stands for other things, but also produces, acts, and is. Building upon this perspective, the author considers ambiguous and disobedient properties of the image as significant elements that reproduce different alternatives of the image and bring possibilities for democratic change. Here her affirmation of the democratic potential of the image is not simply to suggest that images can abruptly and literally make “democratic changes” in the world; rather, it addresses the latent “virtual” power of the image that forms our collective imagining for the future change. The constant reproduction and collective consumption of the image, at a grass-roots level, allows people to collectively engage with certain imaginations of the future and reshape the way we understand politics—which may in turn bring bottom-up changes to the world. I recommend this book for the following reasons. First, the book promotes a transdisciplinary perspective that interacts with art, sociology, material culture studies, and anthropology. Methodologically, it incorporates phenomenology, semiotics, and arts-based research. The book will also inspire a broad range of students and scholars whose research is concerned with transferable lessons of applications and methods. Second, the book achieves a balance between subjectivity— such as the author’s personal engagement with the research subject—and objectivity drawn from theoretical discussions. The book provides a critical examination of the author’s own subjectivity, recognizing what frames our seeing to better understand the complexity of our reception of visual images. Third, along with the author’s own enthusiasm for the research subject, the case studies and empirical examples from various cultural contexts provided in the book make it easier for the reader to understand the semiotics of images. I recommend this book to students and scholars interested in topics ranging from the semiotics of visual images to reproduction and distribution of images and objects, politics of visual branding, art as revolution, and the ideological and political transmission of arts. Adams, T. (2000). White Walls, Black Holes: The Molecular Face of Contemporary Architecture. Interstices 5: 26-35. Deleuze, G., & Guattari, F. (1987). A Thousand Plateaus: Capitalism and Schizophrenia, trans. B. Massumi. London: Continuum. Miller, D. (2010). Stuff. Cambridge: Polity.